Play mat tile size: 32x32cm. Perfect for the Young Child at heart fun. 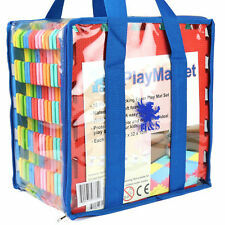 - 1 x Set of 18pcs Children Play Mat. - The children play mats are made of soft EVA foam. - Water Resistant and easy to clean - Can be used to make a Floor Base or Boxes. Camp Roll Mat Soft Yoga Mat Festival Sleeping Tent Lightweight Eva Foam Mattress. Type: Yoga Mat. 1 Yoga Mat. Ideal for camping, fishing and festivals. Compact size and lightweight, easy for carry. Anyway we will try our best to avoid this kind of thing. Ideal for Yoga, Pilates, Stretching Workouts, Especially Hot Yoga. 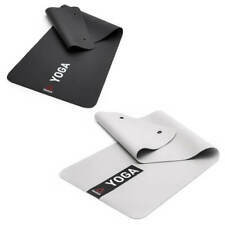 3mm Thickness Yoga Mat for Your Comfort with High Grip Performance & More Sweating and Better Non-slip Effect. - No Stinky "Yoga Mat" Odor. POLE NOT INCLUDED. Heavy duty polyester-reinforced PVC outer cover safe for use with heels and dance shoes. 10MM: length 75CM, folded width 30CM. Colour: The color is as shown in pictures. Light and portable. Also, it could be used on the beach or water, garden, grassland. --Execellent Design : The line design of the corner makes the product stronger, the fine line makes the tumbling mat nice and generous. Length: 185cm. These non-slip mats will help you stay on your hands and feet, even during the most difficult of yoga poses. Give your yoga mat a personal touch by choosing your favourite colour from our 6 colour options. Floor Covering in Van The perfect covering for box or panel van floors. Stick over ply lining to provide a tidy durable surface. Tool Box / Trolley Lining Can be cut to line the draws of a tool box or work trolley. Buy with confidence from the UK's leading manufacturer. Davina McCall Air Flow Exercise Mat - New, in its original packaging. Zumba Wear Top Free Postage!